A lip plate designed to guide beginners toward proper breath utilization, keys with carefully considered dimensions and angles for optimum balance and easy playability. 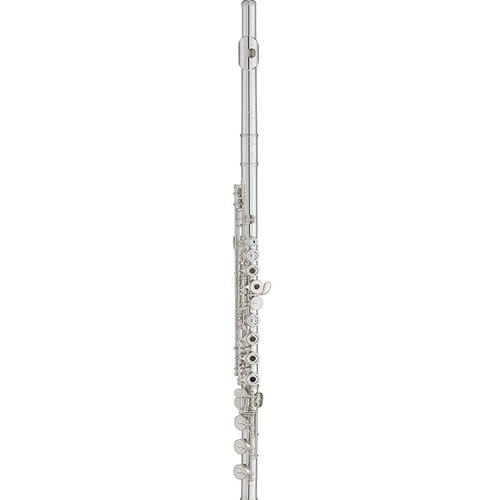 These and other details are some of the reasons why Yamaha student and intermediate flutes have become bestsellers worldwide. An inimitable blend of leading technology and craftsmanship goes into each and every instrument. New refinements include pointed key arms contributing to elegant visual appeal, and a completely revised key parts manufacturing process that significantly enhances overall precision. CY Headjoint Featuring a double flare taper and a unique embouchure hole undercut design for excellent response and a warm rich tone, the CY headjoint helps beginners quickly learn to produce a beautiful sound. More advanced players will appreciate its even, quick response in all registers. Keys All key shapes and placement have been ergonomically designed for a comfortable, natural-feeling performance. Manufacturing processes have been redesigned from the ground up to achieve substantially improved precision that not only leads to greater mechanical accuracy, but also minimizes the need for readjustment over time. Pointed Key Arms A#, F# and other non-fingered keys feature pointed key arms. This beautiful key design is inspired by traditional European style. Adjustment Screws Yamaha's unique screw resistance inserts allow smooth adjustments while preventing gradual loosing of the screws. For easier access, the screw positioning has been changed. Curved Headjoint An optional curved headjoint makes flutes easier for young children to hold and play. It comes with a convenient carring which holds both headjoint and flute case.